The tragic story of Romeo and Juliet, a legend of which nobody can tell if the two unlucky lovers of Verona ever lived. Nevertheless, not unlike many other legends, there are abundant elements of the story that have references to real places and historical facts of Verona. For example, it is many years now since visitors of Juliet's house first started writing their names and love phrases on the entrance walls of this famous place of Verona. There are lovers who want to tie their names to this highly symbolic place by writing them on JULIET'S WALL. There are messages left by those who have had their heart broken and by those who want the world to hear about their love. You'll also find messages of peace and love, phrases written in every language and color. The idea of Juliet's Wall was to make possible for everyone who chooses so to post a message on that wall. Leave your message and let the world know about your love. to post note you need to be registered, it is fast and free. Share your love! I have read and agree to Terms of service .. If you wish to prolong that period you need to visit us again in about 30 days from now or you can e-mail your friends about us or about your post and each e-mail will bring 15 days more to your note. The first way is by adding your banners on our pages. The place of banners you can see in the picture below. Size of banner can be modified according to your wish. The content and appereance of banner must be authorized by Julietswall staff. For information about price, billing, size and duration of banners, contact us. The second way is by putting your logo or just link of your web page in footer of e-mails. Example of this way of advertising you can see in the picture below. The content and appereance of Ad must be authorized by Julietswall staff. For information about price, billing and amount of e-mails, contact us. This license shall automatically terminate if you violate any of these restrictions and may be terminated by Julietswall at any time. Upon terminating your viewing of these materials or upon the termination of this license, you must destroy any downloaded materials in your possession whether in electronic or printed format. 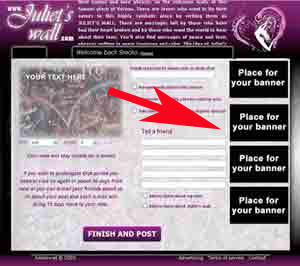 The Julietswall is imaged web site. The materials on Julietswall's web site are provided "as is". Julietswall makes no warranties, expressed or implied, and hereby disclaims and negates all other warranties, including without limitation, implied warranties or conditions of merchantability, fitness for a particular purpose, or non-infringement of intellectual property or other violation of rights. Further, Julietswall does not warrant or make any representations concerning the accuracy, likely results, or reliability of the use of the materials on its Internet web site or otherwise relating to such materials or on any sites linked to this site. Julietswall have no responsibility about content of messages posted on the wall. 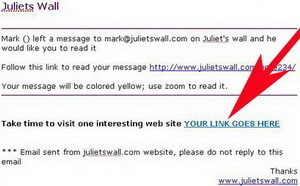 Every user of Julietswall who agreed with Terms of service is responsible for own message. Every note that contains offence versed nations, social groups, religious groups, ethnical groups and other or have impropriet contain will be deleted from database without warning. User who posted that or like message will be banned. Any abuse you can report on our e-mail. In no event shall Julietswall or its suppliers be liable for any damages (including, without limitation, damages for loss of data or profit, or due to business interruption,) arising out of the use or inability to use the materials on Julietswall's Internet site, even if Julietswall or a Julietswall authorized representative has been notified orally or in writing of the possibility of such damage. Because some jurisdictions do not allow limitations on implied warranties, or limitations of liability for consequential or incidental damages, these limitations may not apply to you. The materials appearing on Julietswall's web site could include technical, typographical, or photographic errors. Julietswall does not warrant that any of the materials on its web site are accurate, complete, or current. Julietswall may make changes to the materials contained on its web site at any time without notice. Julietswall does not, however, make any commitment to update the materials. Julietswall has not reviewed all of the sites linked to its Internet web site and is not responsible for the contents of any such linked site. The inclusion of any link does not imply endorsement by Julietswall of the site. Use of any such linked web site is at the user's own risk. Any claim relating to Julietswall's web site shall be governed by the laws of the EU without regard to its conflict of law provisions. In a few short videos we made tutorial for easier manage on Julitswall. Take a little time to watch this videos, if you have any suggestion or need more help, please e-mail us.